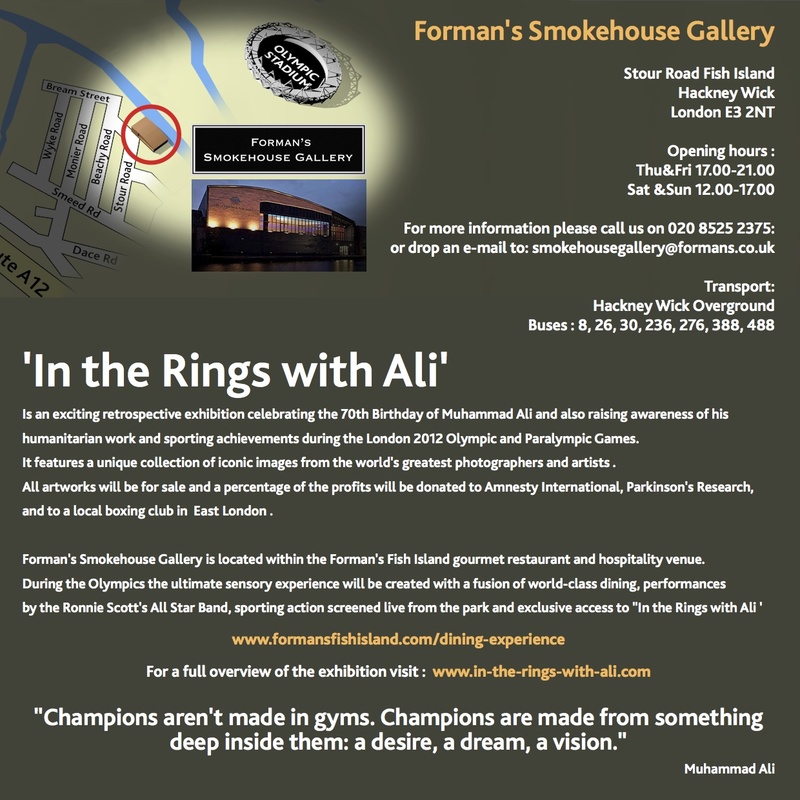 In 2012, to mark Ali’s 70th birthday, a major exhibition is being held at Forman’s Smokehouse Gallery, overlooking the London 2012 Olympic stadium. Photographs and paintings of Ali at different stages of his life will be shown alongside audio and video installations, poetry and memorabilia, recording not just his contribution to sport but also his extraordinary humanitarian work through the decades. • The opening private view on 19th July will bring together some of the greats of British boxing over the last 25 years. They include Duke McKenzie, Dave “Boy” Green, Colin McMillan and Prince Rodney, to name but a few. Other Olympic boxing teams as well as many celebrities will also be invited, including representatives of Amnesty International and Parkinson’s research. 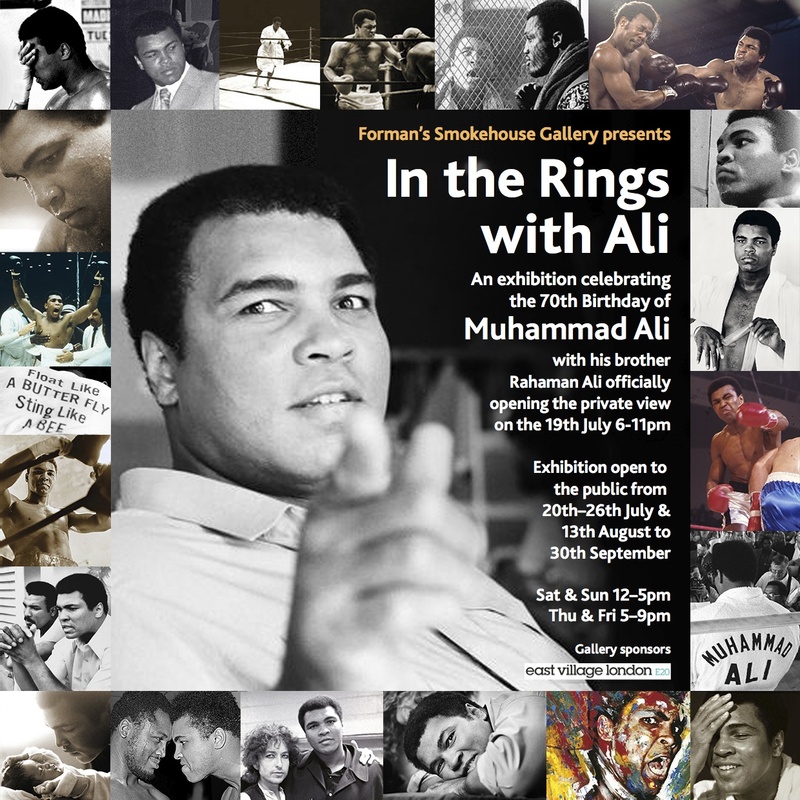 • Ali’s brother, Rahaman Ali, will fly in from the United States to officially open the private view on July 19th. He has also been invited to attend the Olympic torch event in Guildford on the 20th July. • The exhibition organizers and sponsors are teaming up with ex-boxers Oliver Wilson (British Light Middle, Middleweight and Henry Cooper Golden Belt Champion) and Rod Douglas (Commonwealth gold medalist, 4 time ABAE Champion and Olympian) to deliver “The Muhammad Ali Outreach Programme”, which will work with deserving young boxers from Holland and England. Together with Rahaman Ali and young people from the local community, they will present a non-contact boxing extravaganza at the Private View on the 19th July and in Guildford on 20th. • All artworks at the “In the Rings with Ali” exhibition will be for sale and a percentage of the profits will be donated to Amnesty International, Parkinson’s Research, and to a local boxing club in East London. ~ by smokehousegallery on July 10, 2012.